7.92 points at 24 votes (rank 97). 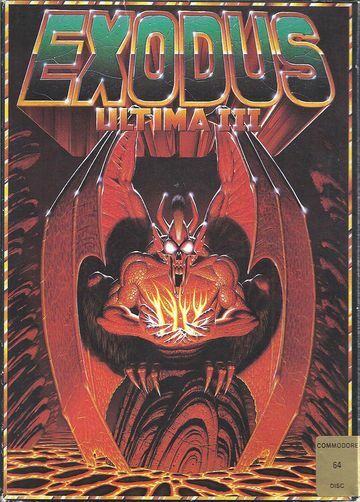 Rombach 10 C64-Spieleführer Teil 2 - "Crème de la Crème"
Ultima 3 - Exodus is the third part of the successful Ultima role play game series, which altogether with its two forerunners forms the trilogy "Age of Darkness". However, for the first time, the player does not only steer a single person here, but a group of up to four adventurers. Numerous further improvements were made, which were to become elementary basics for the following parts of the series. The intro screen acquaints one with some graphics from the game. The delusory peace was kept for hardly 20 years after a mysterious stranger had defeated the wizard Minax in an epic duel. And now a much worse evil is about to bring doom over the land of Sosaria. Exodus, half demon and half a huge computer hard disk, created by Minax and their erstwhile master Mondain, gains consciousness after spending two decades with collecting enough data to get control over the land. The appearing of a volcanic island amidst the ocean and the word "Exodus" written with blood on deck of a crewless ship announces the begin of its reign of terror. Again, the cry for help from Lord British, the ruler of Sosoria, is heard. This time, as many as four brave heroes prepare to campaign against evil. The player can combine up to four characters to a group of adventurers. It is possible to use less, but this does not give you any advantages, moreover it gives you a mass of disadvantages. Each character can allocate altogether 50 points on four character values and choose from a pool of three sexes, five races and eleven classes. So it is possible to create a great number of sensible or absurd combinations, from the female human paladin to the neutral fuzzy wizard. 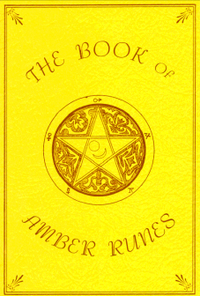 Each newly created character starts with a dagger and some clothes as a starting equpiment, as well as some gold and 150 portions of provisions. Provisions need the be restocked soon, as it is used up quickly and characters that famish lose life energy. Our four friends have hardly started their adventure career, they already receive much attention from two groups of giants and a pirate ship. 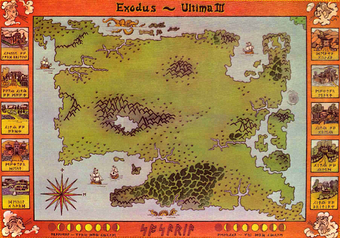 The game starts in the familiar 2D top view on the continent Sosaria, which has changed heavily since its first appearance in Ultima I – The First Age of Darkness. New towns were added and Moongates, which are comparable to the Timegates from Ultima II, open and close in regular intervals to beam travellers to different places on the map. The map comprises numerous screens and is littered with forests in which the sight is restricted, as well as with mountains that cannot be crossed. The land is inhabited by hordes of monsters that appear randomly sooner or later and directly steer towards the group of adventurers. Most of the time you can only escape them if you are mounted. Numerous islands brink the main continent and only wait to be searched through by the adventurers. But perils await you also on the sea, in the shape of sea snakes, huge octopusses and pirate ships. A great number of towns offers the player the possibility to equip in a rough-and-ready way with the little starting money. Computer controlled NPC scurry about here and can be both helpful and hindering for your task to be done. Utterly strong guards take care that the characters behave themselves and will attack instantly if they catch someone stealing or if an NPC is attacked. You can go to the following places which can, however, not be found in every city. 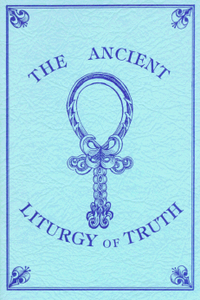 Oracles that give detailled knowledge. However, this costs significantly more money. Healers where you can buy everything for a lot of gold, from cures against poisoning to a resurrection of a dead. Lord British promotes a character. This is of course where Lord British resides. He can give the characters new experience levels and with this more life points, if they have made enough points by smashing monsters. For each new experience level, a hero needs to have collected 100 points. The maximum number of life points for a character is then raised by 100. If you look around a bit you can also find a healer, an oracle and further interesting places in the castle. However, these cannot always be easily accessed. Ladders connect the platforms with each other. These more or less well hidden underground labyrinths are shown in filled 3D vector graphics - in contrast to the upper world. It is only striped strangely in black and white because with these stripes you create coloured areas on the Apple and the code was simply just taken over to the C64 although it cannot create any coloured areas with this method. The dungeons teem with various perils as monsters and traps, but also plenty of rewards in the shape of treasure chests filled to the rim (lower left). You need to provide for light yourself in the dungeons, with the help of torches or magic. Here you can get important (but also misleading) hints that make for the solution of the game. Magical sources (middle) that you find here, can cause both good and unpleasant effects. Glowing metal bars (right) cause the loss of lives when touching them, but they leave behind a strange "mark". Graphics and sound were significantly improved in comparison to the forerunner. The game is much more coloured and for the first time the view is limited by the surrounding such as woods or mountains. All characters are animated even though only sparsely. Also the grade of details of the graphics was slightly improved. However, the game can of course not keep up with titles as The Bard's Tale or "Pool of Radiance" due to its age. Furthermore, the graphics are very slow which has its reason in the fact that the original Apple code is used for the display and this result also needs to be converted to the layout of the C64 graphics mode "on the fly". In this respect is the game even slower than its forerunner. The sound is passably well done. The effects that were originally written for the sound output system of the Apple II, which is in comparison to the SID of the C64 technically utterly primitive, can be filed somewhere between cheap and quaint, but the situational background music is quite audible. Unfortunately, it is far too short to being able to bear it for the whole game. So it does also fall prey to the "volume off" key after some hours. What is the story with this holy place? A strange giant spoder blocks the adventurer's path. U :UNLOCK: open a door lock. Needs a key. J :JOIN GOLD: give all gold to one character in the group @ :NORTH: go north, go forwards in a dungeon. I :IGNITE TORCH: ignite a torch when in a dungeon K :KLIMB: climb up a ladder in a dungeon [ :WEST: go west, turn left in a dungeon. O :OTHER COMMAND: enter a special command L :LOOK: look into one direction ] :EAST: go east, turn right in a dungeon. P :PEER AT A GEM: use a magical gem. Z :ZTATUS: show all character values and the inventory of a character ? :SOUTH: go south, go backwards in a dungeon. N 65 Surmandum Resurrects a dead character. If this fails, he will disintegrate to ashes. P 75 Anju Sermani Resurrects a character that has fallen to ashes. Costs some points of wisdom. For a Wizard you want high Intelligence, as the Intelligence points will determine the Magic Points. The race Fuzzy is better (max 99 Intelligence). For a Cleric you want high Wisdom, as the Wisdom points will determine the Magic Points. The race Bobbit is better (max 99 Wisdom). The Necorp wizard spell leaves enemies so weak that a single physical hit of any sort will kill them (not even the most powerfull spell guarantees killing, only physical hits). This is quite evident when your characters reach 45 Dexterity points, as they will not fail any hit! Don't waste your time with Sanctu Mani, it costs 50 points, and heals less than five Sanctu at 10 points each. Don't waste your time with light spells except in an emergency, buy torches. Keep in mind that the spells to move up and down in dungeons cost magic points, while searching for a ladder may take longer and be risky, but will spare the magic points for other use. The exception is Sequitu to exit the dungeon with a single spell. If Repond or Pontori fail, there is no point in attempting again in the same combat. When a member of the group dies, the game instantly saves this information. When all characters die, the group is (almost) irretrievably lost - at the most you can create a new group with new characters, gain enough money with this group to then be able to resurrect with it the old characters. This can of course be bypassed with trickery in the emulator. If you create a wall of chests in Sosaria surrounding your party, monsters cannot attack you, with the exception of ships (which can fire cannons) and monsters which breathe fire (dragons, etc). Try to get a horse, it will seriously speed up moving around and avoid monsters. You get more stats (Strength, Dexterity, Intelligence and Wisdom) by donating money at the shrines (one shrine per stat, located in Ambrosia). Get your cleric to max Wisdom, your wizard to max Intelligence, then ensure everyone reaches 45 Dexterity to avoid failing hits. If you get more money to donate you can apply it to Strength or Dexterity at will. Easy gold can be located in Death Gulch, ensure you know how to BRIBE a couple guards, and get the Mark of the Force to get even more money (when you're there, do not kill the merchant, briefly freeze the time to get the last couple chests, then you can avoid all guards chasing you). Once your wizard can cast Necorp and your characters are decent at hitting (or perfect at that with 45 Dexterity) you can take care of levelling any characters below level 25 simply by attacking guards, casting Necorp, and put the lower level character to kill them. Remember to visit Lord British to actually level up and get the extra Health Points! 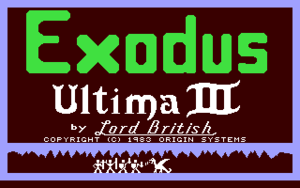 Only Exotics (weapons and armour) can be used in the nasty Exodus castle at the end of the game. Magic powders to negate time do not work there either most of the time! A Wizard (Race: Fuzzy) and a thief (Race: Elve) are almost obligatory for a successful group. The mixed classes as e.g. Barbarian or Lark are mainly useless. However, there are two exceptions: Paladines (Fighter/Cleric) and Druids (Cleric/Wizard). A dwarf paladin has in contrast to a normal fighter the ability to use priest spells and can carry almost all important weapons. The group is perfected by either a cleric or a druid (race: Hobbit) which is responsible for healing spells. You should ponder here: a druid will rise fast, because he can also use magic of the Wizard class, but he will never be able to master the higher cleric spells. However, the druid has a special advantage against all other classes: he regenerates his magic points twice as fast. Another school of thought dispenses with the thief, but then every treasure chest needs to be opened magically or otherwise you will be caught in many evil traps. Furthermore the principal source of income in the game will drop out, which is the robbing of the merchants in the towns. The mere magical users (Wizards and Clerics) are - as in many role play games - weak at the beginning but later one of the strongest characters. Only they will be able to use the highest spells (from letter K onwards). One can think about raising even two Wizards; the group will be almost unbeatable in the end phase. At least one character needs to master the priest spells. The simple healing spell, priest spell C is absolutely vital. As soon as the cleric or paladin or druid has collected 10 magic points again, you should instantly use him. The strongest healing spell K is only worth using when there is an immediate danger to life. Otherwise you get more out of it to use the spell C five times for the same costs. You should equip the thieve and the fighter with firearms. First a slingshot and later a (magical) bow. At the beginning wizards should mainly fight with spell B. If the thief is placed in first position in the dungeons, he will act as a competent track hound for the sometimes deadly traps with which some of the dungeons are virtually peppered with. In second position you should put the fighter, as in fights the "frontline" is formed by positions 1&2 and positions 3&4 are always farthest away from the enemy. After having equipped your group provisionally you should at first fight roaming monsters to be able to buy torches and other useful items for dungeons at the thieves guild and to get the first experience levels and with this more life energy. At first you should avoid going all too deep into the dungeons (5 or deeper). A good dungeon for beginners is the "Perinian Depths" in the north east of the map. Each Moongate can transport the group to three different places. Some locations on the map can only be reached via Moongates. As monsters stubbornly try to get to the group of adventurers on the shortes way beeline you can "remote control" them by skillful manoeuvring that they are held back by impassable terrain. Additionally you can also build yourself a safe "fortress" from unopened treasure chests with some well-placed fights; these can also not be crossed by monsters. There you can unhurriedly (or at least until your run out of food) generate magic points and also get physically fit again with healing spells. When you have conquered a ship you should go and visit the islands. But beware (?) of the maelstrom that shwooshes over the ocean without control. It can also destroy parked ships so you better sail up a river before leaving the ship unattended for a longer time. The safest port is - ironically - the one of Exodus, the maelstrom does not get there - however, at the beginning the player will not be able to get there either. If you are stuck on an island, what is left as a makeshift solution is to break up the group in the main menu and newly compilate it, then you will start again in the castle of Lord British. The world is a sphere: from Fawn you best sail to north-north-west to get into the southwestern bay... This is especially advised to treasure hunters. You cannot transport horses on a ship, but ride over a parked ship. This is especially important towards the end of the game. To have more money at the beginning simply create a new group and give all money and food to one member. Then throw out all the other members and add new ones and repeat this process as needed. You can resurrect a complete dead group by allocating all dead members to a newly created group, which then can be resurrected at the healers. Robotron2084: "An absolute milestone in role play game history. Ultima III is a perfect, early Hack'n Slay role play game with much flair and as yet not so time intensive and repetitive as its followers. The minimum graphics does not bother me here at all. 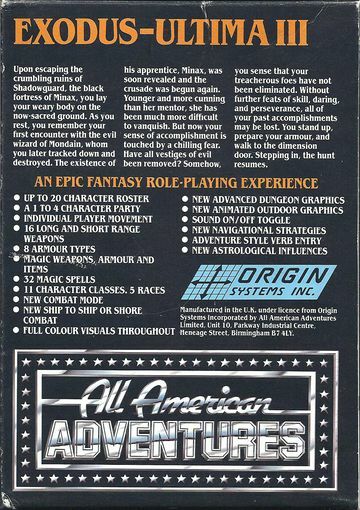 For me it is next to The Bard's Tale THE role play game on the C64. Alone writing this article has brought me almost to playing through it once more. Lets see how many moves I need this time. 10 out of 10 points." 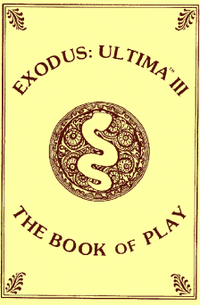 Klaws: "For me the best part of the Ultima series, including the followers on other platforms (and this also includes Ultima Online...). 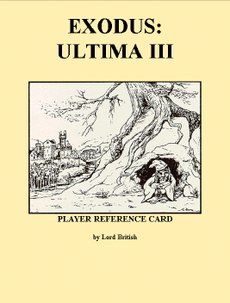 The access into Ultima III is fast. The only thing that appears long-winded to me are the labyrinths - until you have explored all the floors, some time has passed, and then you still have to get back to the surface! Despite the labyrinths 10 points; the game is just great!" FXXS: "After approx. 20.0000 moves I am still not proficient in the controls and the time limit for every move disturbs the analytic quiet that is otherwise typical for round based games. The constant healing gets a bit on my nerves and sailing is also not so much fun because there is calm too often and you cannot sail against the wind. Furthermore, the towns are so ample that while shopping a druid can easily say five to ten healing spells. Yes, it is a classic and it was a milestone at that time without doubt, but it nevertheless is only mediocre fun to me, because it seems so unnecessarily cumbersome, therefore 7 out of 10 points." 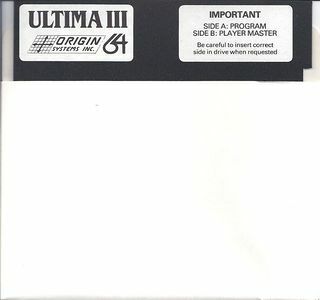 Ultima III was the first game in Origin's product range. The template for the map of cloth was drawn by Richard Garriott's mother. Fast loader with support of 1541, 1570, 1571, 1581, CMD FD, CMD HD. Optimised code, by this the game runs faster. At present, these seem to be not comaptible with emulators or seem to be defect, both on C64-Games.de and Gamebase64. This page was last modified on 31 October 2018, at 03:19.